Find a Redguard woman who is on the run from Hammerfell. The Alik'r Warriors are interrogating Redguard women all over Skyrim. Get the quest from the Alik'r Warriors in Whiterun. Find Saadia at The Bannered Mare. Speak with her or report her to the Alik'r in Rorikstead. Kill Kematu or lure Saadia to the stables. Collect your reward from Kematu or Saadia. After Irileth informs the jarl about the dragon attacking the Western Watchtower during Dragon Rising, you may come across guards looking for a Redguard woman in the city. You may also observe an argument between Whiterun guards and Alik'r Warriors regarding their presence in the hold, or you may find Alik'r Warriors interrogating Redguard women in the Skyrim wilderness. Speak with the Alik'r to start the quest. Speak to the Alik'r warriors in Rorikstead and tell them of Saadia's location. Follow Saadia's instructions in order to help her. A third, more treacherous route is to agree to help the Alik'r, then kill them when you're in a better position, stealthily backstabbing them and pickpocketing weapons off of them. This will allow you to go back to Saadia and let her know that she won't be further troubled, and you can complete the quest without turning her in. Saadia will pay you only 500 coins. If you decide to help Saadia, go into the dungeon of Dragonsreach and speak with an Alik'r Warrior that was captured. 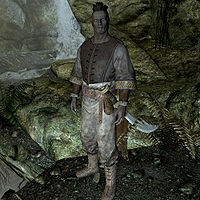 After paying 100 gold to a guard, the prisoner will tell you that the leader of the Alik'r is in a cave west of Whiterun called Swindler's Den. If you have already cleared out Swindler's Den, a dialogue option will appear when talking to Saadia that will reveal to her that you know where they are, allowing you to skip this part of the quest. Upon reaching Swindler's Den, you'll find that it's full of bandits. Make your way through the network of tunnels, killing every bandit in your way until you reach a passage with a waterfall. As soon as you walk through the wall of water, Alik'r leader Kematu should initiate a conversation. He claims that Saadia is wanted for treason, for selling Hammerfell out to the Aldmeri Dominion. If you still want to help Saadia, you'll have quite a fight on your hands. At least four Alik'r Warriors will assist Kematu, often more. However, use of the Mayhem spell here makes the fight a breeze. Fighting the host of Alik'r warriors can be made easier by using the bear traps at the mouth of the winding path that leads into the cave where Kematu awaits. The warriors get hung up in the path, allowing the traps to be reset. Success is facilitated by focusing on your high-offense attack while retreating. Once your stamina or magic is depleted, turn and run for the traps, being careful to jump over them as you pass. It is also possible to simply exit the conversation with Kematu (or tell him that you will help lure Saadia away), sneak into the room just ahead, and snipe all the warriors with your bow. Once the Alik'r are dead, loot Kematu's corpse for bonus gold, then go get your reward from Saadia. If you decide to help the Alik'r capture Saadia, Kematu or the Redguards with whom you spoke in Rorikstead will ask you to lure her to the stables outside of Whiterun. Go back and talk to Saadia in The Bannered Mare and ask her to follow you. Once she gets to the stables, Kematu will use a paralyzing spell on her. Talk to him for your reward. While Kematu and Saadia are talking at the stables, you can still kill Kematu before he casts the spell on Saadia. This will get you the reward from Saadia and the gold that Kematu is carrying, without having to fight the rest of the Alik'r. If you kill him after he casts the spell, however, Saadia will attack you when she gets back up. You can also allow Kematu to cast the spell on Saadia and collect the 500 gold reward, thus ending the quest, then kill Kematu to undo the spell on Saadia. At this point, Saadia will be hostile right away, so use a Calm spell on her, then talk to her, and she will give you the 500 gold reward for killing Kematu. You can then loot Kematu's body to get 200 gold, his attire, and his sword. Once the Calm spell ends, Saadia will become hostile again. Kill her and then loot her body. She will also have gold and jewels. Both characters will be dead, but you will have gained maximum rewards, equaling 1,200 gold plus random jewels. The Whiterun guards will not release the Alik'r prisoner even if you pay his fine. If you kill Saadia after turning her in and receiving your reward, Kematu will leave and say, "All that effort, and you just kill her. You've ruined everything." If Kematu is resurrected with the dead thrall spell, the dialogue to complete the quest will not appear when speaking to Saadia. To fix this kill the enthralled Kematu and speak to Saadia again. If you do not directly kill Kematu (i.e., Frenzy or Fury on him or the Alik'r), the quest will be stuck on "Kill or talk to Kematu". See Quest Stages and skip to step 160 to progress the quest. You can approach and kill the Alik'r in the cave before speaking with Kematu. Performing a power attack will result in a finishing move on the Alik'r but will not trigger the others to attack. In this fashion, the room can be cleared before engaging Kematu in either conversation or combat. Note that while the Alik'r are being killed, Kematu may comment on someone having been murdered, but there is no murder count increase for these actions. ? If you kill the Alik'r warriors in the Swindler's Den, two Alik'r warriors will sometimes end up constantly appearing in Whiterun by the entrance. If you kill the Alik'r warriors in the Swindler's Den, encounters where Alik'r warriors harass a Redguard woman may still occur. Using the alternative route mentioned above, sometimes killing Kematu after he casts the paralyze spell on Saadia will not cause her to turn hostile but will still allow you to report that the Alik'r have been taken care of, hence getting both rewards. ? After you hand Saadia to Kematu, sometimes Kematu and the Alik'r keep staying in Swindler's Den. No more conversation options are possible and the dungeon cannot be cleared. To fix this last problem manually, one can use the console command SetLocationCleared 00018EE2 1. Sometimes when you talk to the Alik'r warrior in jail and go to the guard, they won't enter conversation with you, forcing you to go directly to Swindler's Den. If you have an outstanding bounty in Whiterun, the guards will not enter conversation with you, preventing you from paying the prisoner's fine. You will need to reload the save and clear your bounty prior to entering the dungeon to move forward. Sometimes Saadia will disappear in Whiterun when you take her to the stables. Sometimes if you enter conversation with the jailed Alik'r warrior a second time before speaking to the guards to pay his fine, his next dialogue option will come up early. Despite entering the new line of conversation, he will not give you the required information and your quest will not update. Paying his fine will not progress the dialogue further at this point. ? You can reload the save to fix this, or bypass and go to Swindler's Den directly. Entering Swindler's Den without talking to the Alik'r Prisoner may result in the objective to talk to the prisoner never being removed from your journal. 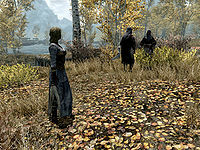 If you choose to betray Kematu after escorting Saadia to the stables the quest log may fail to register "Speak with Saadia" as complete no matter if you talk to her soon after defeating Kematu or once she is back to The Bannered Mare although the game will count the quest as finished. 10 A group of men calling themselves the Alik'r are looking for a Redguard woman in Whiterun. 25 The barmaid at the Bannered Mare in Whiterun is apparently a fugitive noble from Hammerfell. She claims that she is on the run from assassins sent by rival houses in her homeland and needs someone to stop them before they find her. 175 The leader of the so-called "assassins" I've been asked to eliminate claims that Saadia betrayed her people to the Dominion and they are here to bring her to justice. I've agreed to lead her into an ambush at the Whiterun stables. 200 Finishes quest I've helped Saadia escape the clutches of the Alik'r sent after her. With their leader defeated, she believes the rest of them will scatter, affording her some much-needed safety for now. 201 Finishes quest After making arrangements with Kematu, I've delivered Saadia to him. He assures me that she will be taken back to Hammerfell alive, though after that her fate is no longer in his hands. On the PC, it is possible to use the console to advance through the quest by entering setstage MS08 stage, where stage is the number of the stage you wish to complete. It is not possible to un-complete (i.e. go back) quest stages, but it is possible to clear all stages of the quest using resetquest MS08. This page was last modified on 17 March 2019, at 14:25.